Flowing into the Gulf of Mexico the Guadalupe River source spring up in the Texas Hill Country. In 1964 the Army Corps of Engineers saw fit to dam the Guadalupe River about 12 miles west of New Braunfels, TX. When the dam was completed, a tailwater trout fishery was born. Texas Parks and Wildlife saw the opportunity to create a trout fishery to replace the native fishery, which had been lost for several miles due to the new, colder water flowing from the bottom of Canyon Lake. Fly fishing in Texas for Guadalupe River trout was born! Because the Guadalupe River is a tailwater, the water for the first twelve miles below Canyon Dam can typically sustain trout year-round. Some years are better for the trout than others, depending on dam releases and rainfall amounts. Temperatures in the best trout fishing months, November – May, typically average 55-65F. Springs and seeps help moderate the river’s temperature in both the summer and winter. At times the water is gin clear, but most of the time there is around 3 – 4 feet of visibility, which means the fish can see your flies, and you can see the bottom when you’re wading. My rule of thumb, when the water is not crystal clear, is if you can’t see the bottom, don’t take that next step. 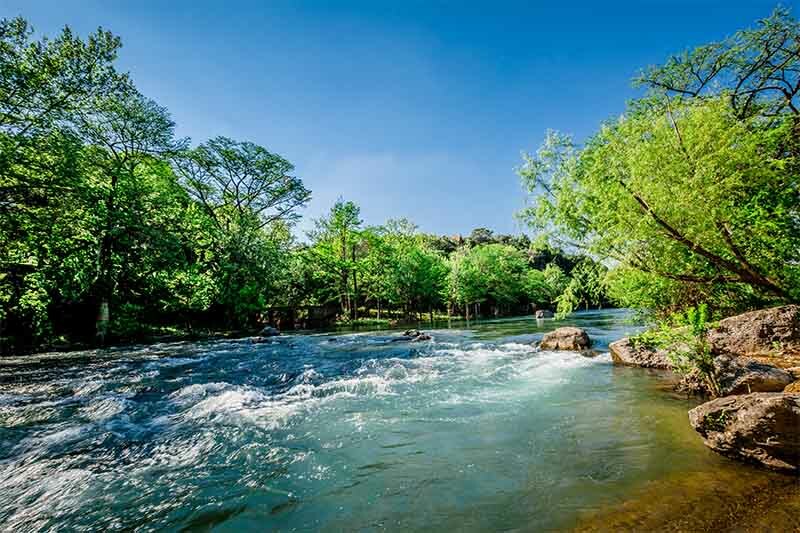 The Guadalupe River is characterised by the typical riffle-run-pool flow, and although the riffles are few and far between, the fish love to hang just beyond where the riffles spill into runs. Even without a lot of riffles, the Guadalupe River does have a lot of other great holding water, due to the abundance of limestone “cuts”, or ridges, in the bottom of the river. These ridges make wading tricky but give the fish safe haven from both current and predators. Where in a typical river a 1-2mph flow on a flat bottom will probably not hold trout, Guadalupe’s limestone cuts provide cover and help channel food to the trout. Not much pocket water exists, so finding these cuts in the river is one of the keys to success for fly fishing the Guadalupe. Texas Parks and Wildlife stocks around 15,000 rainbow trout every winter (Dec – Feb), at the dam’s tailrace for put-and-take fishing and at a few other locations downstream from the dam. The Guadalupe River Chapter of Trout Unlimited has been instrumental in maintaining a superb trout fishery on the Guadalupe River by stocking around 15,000 lbs of catchable size rainbow and brown trout every year (Nov – March). Guadalupe River trout range from 10 – 18″, with the majority in the 14-16″ range, and there’s always some bruisers. Some years are better than others for holdover trout, but every year even the recently stocked trout are great fighters. Guadalupe River Fly fishing is primarily done via wet flies, nymphs, and streamers. Although at times it pays to have some mayfly or caddis dry flies, think about subsurface flies while reading the information below. Midges, mayflies, and caddis are the predominant prey insects for Guadalupe trout. Smuts, sowbugs, damselflies, dragonflies, and inchworms are also present in the river, though not as important to the trout or the fly fisherman during the best trout fishing months. The most important flies over the past several years have been Chironomidae (midges). They are tough little guys and can survive a lot of different conditions, which is exactly what the Guadalupe River has thrown at them over the past several years. They are a favorite of all tailwater fishermen, and one should not be without them when fly fishing the Guadalupe River. Caddis flies, once a tremendous source of evening hatch fun, have rebounded after the 2002 flood. Caddis are very adaptable, and their population on the Guadalupe is continuing to increase. Blue-wing Olive (beatis) mayflies have also repopulated the Guadalupe River after the 2002 flood, and you can find great bwo activity on the Guadalupe recently, especially on cloudy days. A species of Isonychia mayfly, or slate drake, have been available in great abundance during the past few seasons. They hatch from November – June, with the heaviest hatches being from late Nov – mid-March, typically between 11 am and 3 pm. a #22 spinner, which isn’t a Guadalupe trout but is still fun. Hexagenia mayflies (bigassus) supposedly hatch at night, but from time to time you’ll mistake one for a tree branch floating down the river in the middle of the day. They don’t present enough of an opportunity to trigger hatch-like feeding conditions. But the kingfishers see them!